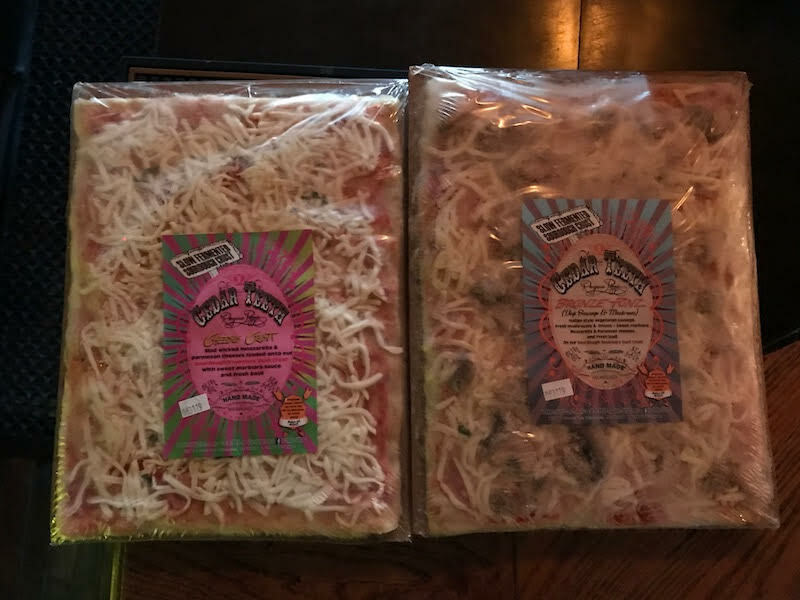 Published March 23, 2019 at 3:01 p.m.
OnMilwaukee's on the hunt for good, frozen pizzas – which (for better or for much, much worse) we nicknamed "froza," kind of like "froyo" – in bars and taverns. Last week, we downed a delicious one at The Newport, and this week, we had a couple of Cedar Teeth pies at Burnhearts, 2599. S. Logan Ave.
Cedar Teeth pizzas, which are vegan and vegetarian, are rectangle in shape, making the squares-vs.-triangles argument moot. 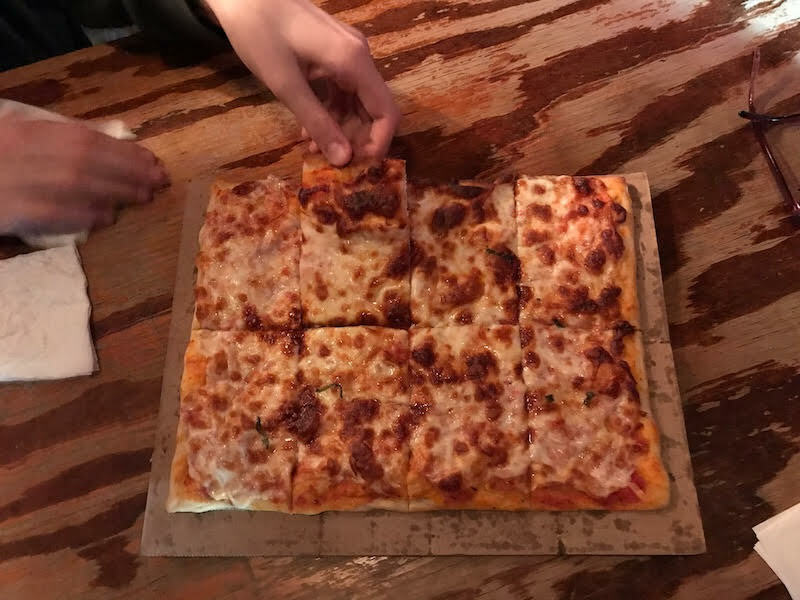 The rectangular pizzas are also cut into rectangle-shaped pieces, which we couldn't help think looked a little like a top row and bottom row of teeth, aptly. Burnhearts has five varieties of Cedar Teeth pizzas made to order in a pizza oven behind the bar. We tried the Cheesus Chrust (cheese pizza) and the Bronze Fonz (veggie sausage and mushroom) for $10 each. It's the crust – called a "sourdough rosemary dust crust" – that sets Cedar Teeth apart from any other frozen pizza we've sampled. It's thin-ish and chewy – firm but not crackery – with a buttery-hint-of-herbs flavor. The fact it's handmade and a Bay View-based product makes it even better. Five years ago, I wrote an article about Cedar Teeth and enjoyed revisiting owner Hannah Roland's story this week. Check it out here. And we're still looking for excellent frozen pizzas in bars to try, let us know if you have a favorite.